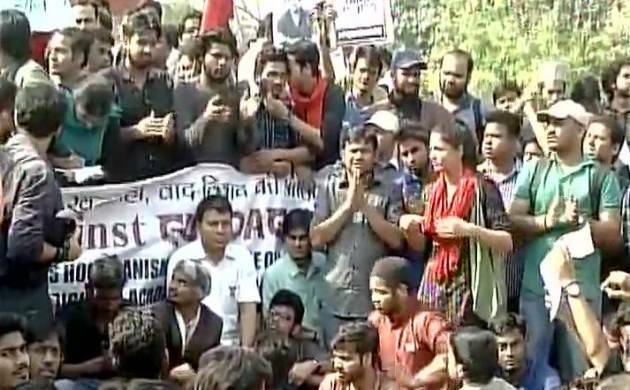 A lawyer has filed a criminal complaint seeking lodging of an FIR against those who allegedly raised anti-national slogans at Delhi University's Ramjas College, with a city court deciding to give it a hearing next week. Chief Metropolitan Magistrate Satish Kumar Arora, before whom the plea came up, asked the lawyer why he wanted to get into a matter involving students. He said he was sending the matter to the court of Metropolitan Magistrate Abhilash Malhotra for hearing. "There are many other pertinent issues to deal with. It is between students. Why are you entering into it? I am marking it to Metropolitan Magistrate Abhilash Malhotra for consideration for March 6," the CMM said. The plea was filed by advocate Vivek Garg who said he had given a complaint to the SHO of Maurice Nagar Police Station but no action was taken, following which he moved the court. In his complaint, the lawyer alleged that "massive anti-national slogans/activities were being carried out by leaders/students of All India Students Association(AISA)/ Students' Federation of India (SFI) in Ramjas College, shamelessly and openly which supported India's enemy i.e. Pakistan. "The criminal acts of accused were also boosting morale of terrorists against our country." On February 21, members of RSS student wing ABVP had gathered outside the college and shouted slogans in protest against a seminar for which JNU students Omar Khalid and Shehla Rashid were invited. The ABVP members allegedly pelted stones, vandalised the venue and disrupted the seminar. The next day violent clashes erupted between Left and ABVP students leaving "several students and three teachers injured".